Employees at my workplace don’t know how to ride the elevator. Or maybe I’m just hyper sensitive since I was gone for a week and have lost my touch. 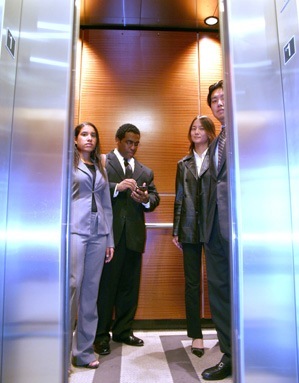 So here are a few etiquette ideas to make your elevator ride unremarkable (I was going to say enchanting, but the only elevator ride that describes that would be one with Willy Wonka). 1. Learn how to enter an elevator. I know I have this problem too. I’m in a hurry so I try to board before I let the person exit. Either that or I’m afraid that the elevator doors will slam shut and I’ll have to sacrifice an arm or an ankle to make it in. However, a little patience makes things run smoother and people are less likely to be run over. I’m just saying. 2. Upon entering elevator, make sure the floor you are going to is selected and moving as far back as you can. The other day, I hoped on the elevator and went to go press the button for my floor and found that the two companions on my trip had positioned themselves right in front of the control stations, thus blocking me from being able to press my floor. Awkwardly, I snuck a hand in, pressed the button and moved to the back of the elevator. 3. If you are planning to exit on a floor in a crowded elevator, let someone know before you get to your floor. There are honestly days when the elevator is packed. Usually, I know my floor is coming because I can see where we are at near the control station. Instead of shoving through and trying to push past everyone before the doors close, maybe let the person directly in your path to the exit that you’ll be getting off at this stop so that they can be prepared. 4. Keep your conversations private. This is an enclosed space. No need to share private conversations via phone calls or with others on the elevator. Whether you realize it or not, people can still hear you. Also, nine times out of 10, your cell phone will lose the signal in the elevator. So just wait to call that person anyway. Or delay your ascension. 5. Stop with the lame jokes. The worst one is the last person who gets on and is standing by the door turns around to the group and says, “I’ve called this meeting to discuss some things with all of you, so let’s get started.” Just… no. It’s not that funny. Good luck in your future rides on the elevator. Haha, this is awesome! I’m one of those people who will pretend I don’t hear someone coming behind me and let the doors close before they get there. Thus avoiding most of those problems. I kind of hate riding on elevators with strangers.